Waking up to the sound of an alarm is a nuisance. The sleep breaks abruptly and the day feels fatigued and even headache in some cases can be attributed to this. Many manufacturers having been working on devices, which will nudge you instead of abruptly waking you up from sleep. Many of such devices have been popular too. Unfortunately they are usually costly – upwards of $100. Some manufacturers are trying to take advantage of smart phones to nudge you or gradually wake you up from sleep. There are a few smart developers, who have developed apps, which will gradually wake you up, making it a brighter and smarter way of getting up. One such app is Healthy Alarm. Healthy Alarm app solves the very basic problem, which most of the alarms have. Healthy Alarm makes you perform a few activities that are specifically designed to improve your waking pattern. Healthy Alarm does not have a snooze button. Instead of the snooze button, there are a set of activities to be performed so you can silence the alarm. As the Healthy Alarm sounds – you cannot turn it off without doing simple bodily movements that will give your body a dose of an exercise. 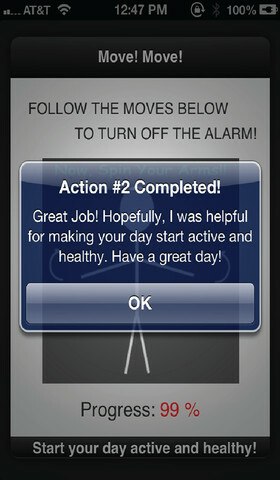 Once you complete the on-screen exercise that the alarm will turn off and your body is now up to start your day. The Healthy Alarm completely changes the way that you wake up – instead of snoozing, you must perform a few activities that are specifically designed to improve your waking pattern. Set multiple alarms for different days of the week and keep active every morning with your new wake-up buddy. I’ve been using Healthy Alarm for about 2 weeks and I must say that it has been a great experience getting to jump-start my day. I set multiple alarms for different days of the week and keep active every morning with my new wake-up buddy. A modern take on the conventional alarm clock! Perform exercises to turn the alarm off! Repeat alarms on certain days. Start your day with Healthy Alarm and have a wonderful and healthy life!